Place pork chops in large resealable food-storage plastic bag. Add seasoned salt; shake bag to coat pork. Spray 5- to 6-quart slow cooker with cooking spray. In cooker, mix remaining ingredients except cranberry relish. Arrange pork chops on stuffing mixture. Cover; cook on Low heat setting 4 to 5 hours. 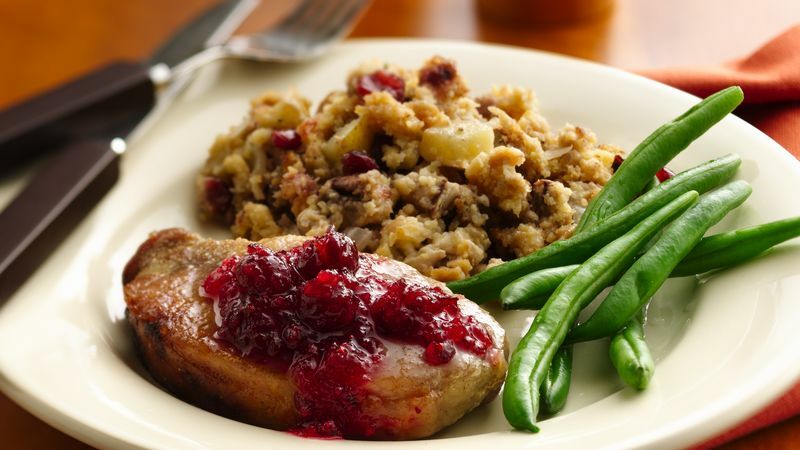 Serve pork and stuffing with cranberry relish. If you prefer your stuffing on the dry side, reduce the amount of water by 1/4 cup. It's easy to change the taste of this stuffing—just swap the cranberry relish or sauce with a different flavor.